The 1979 hit All The Gold In California was one of Larry Gatlin's three number one country hits. It's also from his most popular album Straight Ahead. He usually performs with his brothers Steve and Rudy. He was born May 2, 1948 in Seminole, TX. His dad worked on oil rigs so the family moved around a lot in Texas. They grew up singing in church and won local talent contests. Larry played football in high school and then at the University of Houston. After college, he joined the gospel group The Imperials. They were playing Vegas and Dottie West thought Gatlin looked like singer songwriter Mickey Newbury. She recorded a couple of Gatlin's songs and she got him a job in Kris Kristofferson's band. Gatlin moved to Nashville and signed with Monument Records. He recorded six albums for Monument and scored his first number one country hit with I Just Wish You Were Someone I Love in 1977. 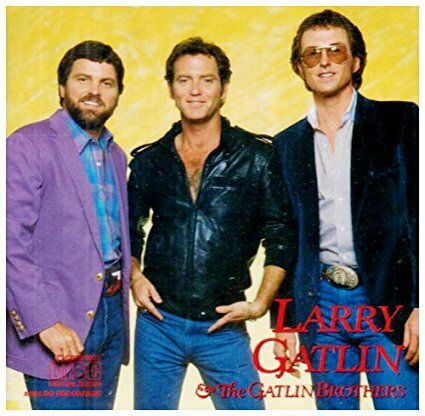 Gatlin's brothers Steve and Rudy first appeared on the 1976 album Larry Gatlin with Family & Friends. 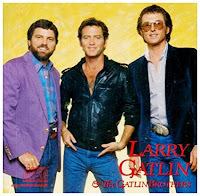 When Gatlin signed with Columbia in 1979, they were billed as Larry Gatlin & The Gatlin Brothers. Straight Ahead was their first album on Columbia. It was certified Platinum. And All The Gold In California topped the Country Singles chart. Gatlin wrote the song while he was stuck in a Los Angeles traffic jam. The song is about how the bright lights of Hollywood aren't what they are cracked up to be. Gatlin performed the song at President Ronald Reagan's 1985 inauguration. Gatlin continued to have success in the 80s. You can get all his Columbia hits on this budget comp. Gatlin left Columbia in 1989 and he recorded one album for MCA and then three for Capitol. In 1992, the Gatlins retired from touring and opened their own theater in Myrtle Beach. He still records occasionally. Gatlin appears as a commentator on Fox News Channel and he hosts a couple of shows on WSM radio in Nashville. The group appears regularly on the Grand Ole Opry and they also tour. Here's Larry Gatlin & The Gatlin Brothers performing All The Gold In California on Pop Goes The Country.